Experimental breast cancer drugs from Pfizer Inc. (PFE) and Eli Lilly & Co. (LLY) slowed or halted growth of advanced tumors in studies, potentially adding a new treatment option for patients and top-selling therapies for the companies. Pfizer’s palbociclib doubled to 20.2 months the time in which patients’ advanced breast cancer didn’t progress, the drugmaker said today. In an unrelated study, Lilly’s drug, bemaciclib, aided 61 percent of patients with metastatic, hormone-sensitive breast cancer, meaning the size of their tumors shrunk by 30 percent or didn’t increase for 24 weeks. Doctors and investors have been awaiting results for the medicines, part of a class called cyclin-dependent kinase 4/6 inhibitors. The therapies offer a new treatment avenue for about 80 percent of patients whose breast tumors are hormone receptor-positive. Palbociclib is projected to sell $3.11 billion in 2020 as it expands to fight other cancers. 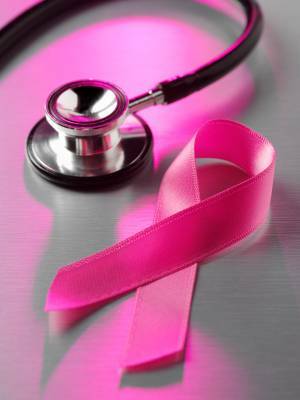 Breast cancer is the most common form of cancer in women, killing an estimated 40,000 a year, according to the National Cancer Institute. Hormone receptor-positive forms of the disease are typically treated by blocking hormone production in the body. When that doesn’t work, the tumor cells can begin to grow and spread, requiring chemotherapy to kill them. Patients “don’t often do well with chemotherapy,” said Judy Garber, an oncologist at the Dana-Farber Cancer Institute in Boston and a past president of the American Association for Cancer Research. “You often feel like you’re giving more and more toxicity and less and less activity,” she said. The CDK drugs are a promising option, she said. Lilly’s drug, also known as LY2835219, was studied in a Phase 1 trial of 132 people with five types of tumors, including 36 with hormone receptor-positive breast cancer. The breast cancer patients in the trial had advanced disease and had tried about seven other treatments before Lilly’s. Of those, 25 percent had their tumors shrink and 55 percent had them stay the same size. Eighteen are still taking the drug, and one has been alive almost two years after beginning therapy, according to the company. Progression-free survival, a measure of how long patients’ disease didn’t get worse, was 9.1 months. It’s too early to know exactly how the drugs compare, though Lilly’s drug appears potent, said Mark Schoenebaum, an analyst with ISI Group LLC in New York. One difference is that Lilly’s drug can be given continuously, Schoenebaum said, while patients using the Pfizer drug may need to break from treatment every three weeks. “There is very little, if anything, in Lilly consensus estimates for this drug — so, in theory at least, it represents all upside,” he said. The most common side effect was neutropenia, low rates of a type of white blood cell, in 11 percent of patients. Other side effects included nausea, vomiting and fatigue. About 2 percent of patients quit the drug. “What we think we have here is an oral drug that helps prevent the growth of cancer cells, that has good single-agent activity and that you can continuously dose with low discontinuation rates,” Richard Gaynor, senior vice president of oncology development at Lilly, said in an interview. The Indianapolis-based company’s drug is moving into late-phase testing, bypassing a mid-stage study. Pfizer has also started a final-stage test. Pfizer shares fell less than 1 percent to $32.16 in New York trading on April 4, after growing 10.5 percent in the previous 12 months. Lilly’s stock rose less than 1 percent, after increasing 4.5 percent in the previous 12 months. The CDK 4/6 inhibitors target cyclin-dependent kinases, part of a tumor cell’s pathway to divide and grow. The drugs shut them down, which can cause the tumor to shrink as the cells die. The therapies may also be used long-term by patients to make sure their cancers don’t come back. The treatments are also being studied in other tumor types, such as lung cancer. The study also looked at the drug’s survival benefit, which showed a trend toward longer survival without being statistically significant. Patients taking palbociclib lived about four months longer, in the analysis, than patients on Femara alone, Pfizer said. Not enough patients in the trial have died, though, for there to be a definitive result. The results of both studies were released today at the American Association for Cancer Research meeting in San Diego.